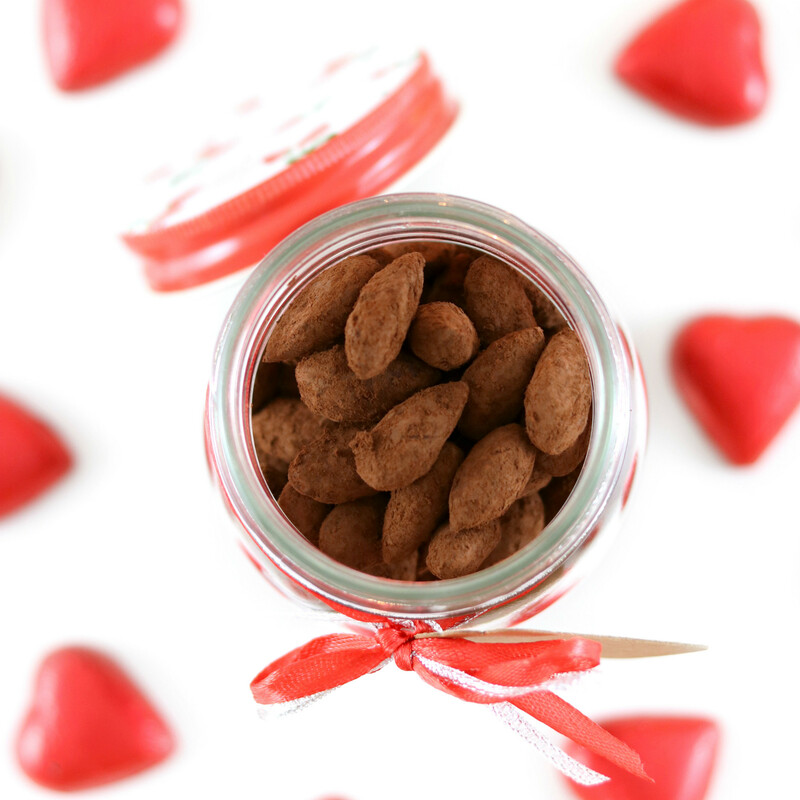 A healthy chocolate treat that makes the perfect homemade gift idea for Christmas or Valentine's Day, this Healthy Cocoa Roasted Almonds Recipe is gluten free, vegan, refined sugar free, grain free, clean eating friendly and has paleo and low carb options so everyone can enjoy them. 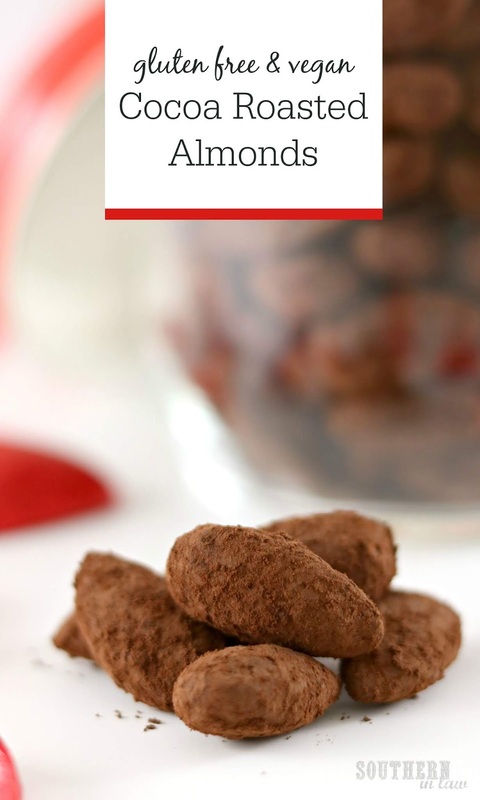 Chocolate covered almonds have never been healthier or easier to make! You see, when you're a coeliac and have to eat gluten free, travelling can be difficult. Trying to find safe options that aren't cross-contaminated with gluten or filled with gluten that you didn't know was there because the ingredients list is in a foreign language. Wondering whether supermarkets will have a big gluten free range or whether you'll be living on rice cakes and greek yogurt for the next three weeks. Going through security lines as watching the officers faces when they see each one of your carry on bags is full of food and saying "yes... that's all for me". You see, we were on an American Airlines flight from Dallas to Los Angeles when Jesse ordered a snack box - and when it arrived I found it was full of gluten free food. Poor Jesse quickly lost half of the items in that snack box as I claimed them as my own (don't worry, he had other food... I'm not quite that selfish). And one of those items were cocoa roasted almonds. It was a teeny tiny packet full of the things dreams are made of. They were sweet, crunchy and oh so delicious. So what was one of the first things I had to do when I got home? Recreate them, of course! In true Kristy fashion, I wanted to make this recipe as simple as possible and as healthy as possible - and, dare I say it, I totally nailed it. These cocoa almonds require just four ingredients - and they take only 17 minutes to make (and yep, we totally timed it). The hardest part of the whole process? Waiting for them to cool so you can devour them - and resisting the urge to eat the ridiculously hot toffee pieces that are left on the tray after you pour the almonds into the cocoa (please, resist the urge... I didn't and let's just say my fingertips lost a few layers of skin...). But basically, these are SO delicious that gifting them to someone else is the greatest expression of love in the world because you will not want to share them. But enough talking - I need to give you the recipe so you can make these ASAP! A healthy chocolate treat that makes the perfect homemade gift idea for Christmas or Valentine's Day, this Healthy Cocoa Roasted Almonds Recipe is gluten free, vegan, refined sugar free, clean eating friendly and has paleo and low carb options so everyone can enjoy them. 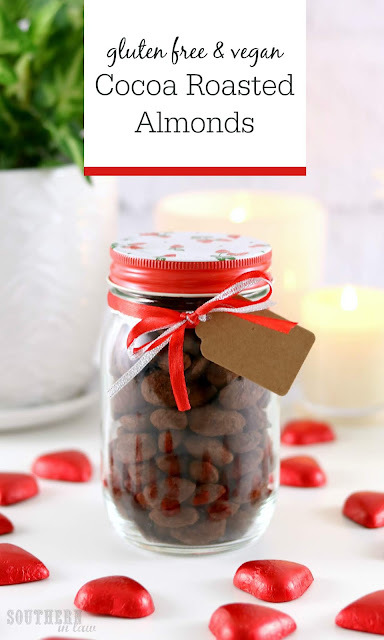 Chocolate covered almonds have never been healthier or easier to make! Click here to pin this recipe on Pinterest! In a mixing bowl, add your almonds, coconut sugar, maple syrup and salt and stir until all of your almonds are coated. Pour your almonds onto your prepared tray and bake for 30 minutes or until the sugar is caramelised and your almonds are toasted. Stir your almond mix around every 10 or so minutes to ensure everything is evenly cooked. Once you remove your almonds from the oven, immediately pour your almonds and the sugar mixture into your container with the cocoa powder. Seal tightly and shake to coat all of your almonds. Once all of your almonds are coated, place them onto your second clean tray and allow to cool completely. *For a low carb option you can use sugar free maple syrup. **For a paleo version, you can use unsweetened cacao powder. These almonds are quite dark, so if you like your chocolate sweeter, take out 1 tbsp of cocoa powder and replace it with 1 tbsp sifted icing sugar/powdered sugar. When it comes to travelling, are you super organised or super laid back? And what's your favourite plane snack? I am totally laid back on short flights - but when we travel on long haul flights (where we're travelling for 26+ hours), I've got to be organised and have to make sure I have enough food!